Los Angeles Philharmonic Resident Conductor Lionel Bringuier will lead the Baltimore Symphony Orchestra in Tchaikovsky’s Romeo and Juliet Fantasy-Overture on Friday, April 13 at 8 p.m. and Sunday, April 15 at 3 p.m. at the Joseph Meyerhoff Symphony Hall and Saturday, April 14 at 8 p.m. at the Music Center at Strathmore. Los Angeles Philharmonic Resident Conductor Lionel Bringuier will lead the Baltimore Symphony Orchestra in Tchaikovsky’s Romeo and Juliet Fantasy-Overture on Friday, April 13 at 8 p.m. and Sunday, April 15 at 3 p.m. at the Joseph Meyerhoff Symphony Hall and Saturday, April 14 at 8 p.m. at the Music Center at Strathmore. In his BSO debut, 25-year-old French conductor Lionel Bringuier and the BSO present an all-Russian concert to also include Mussorgsky’s Night on Bald Mountain and Stravinsky’s Firebird Suite. Also on the program is Khachaturian’s dazzling Violin Concerto, which will feature the talents of Jonathan Carney. Please see below for complete program details. Instantly recognizable to listeners of all backgrounds, the love theme of Tchaikovsky’s Romeo and Juliet Fantasy-Overture is first introduced innocently by the English horn and violas – it isn’t until the climax of the piece that the highly-recognizable, fully orchestrated, luscious execution of the theme appears. As the timpani echoes a dying heartbeat, this melody returns once more in the coda, only this time it is eerily lifeless. Considered to be Tchaikovsky’s first masterpiece, Romeo and Juliet also became the first of several works inspired by Shakespeare, including The Tempest and Hamlet. Based on a Russian folktale, Mussorgsky’s Night on Bald Mountain is a tone poem that depicts a witches’ Sabbath on a barren mountaintop. Described by the composer as “hot-blooded and disorderly,” the piece possesses boldness and sense of chaos that Mussorgsky’s friends and colleagues found completely unsuitable for publication or performance. Although greatly discouraged by their criticism, Mussorgsky revised the score on multiple occasions, but never heard the piece performed by an orchestra in his lifetime. After Mussorgsky’s death in 1881, master orchestrator Rimsky-Korsakov reworked the composition to create the orchestral version of Night on Bald Mountain that is most commonly heard today. A spectacular showpiece, Khachaturian’s Violin Concerto displays a unique sound that is altogether reflective of the composer’s background. Born in Armenia, Khachaturian was exposed to Armenian folk tunes throughout his childhood, yet as an adult he entered the Moscow conservatory, where he was schooled in the Russian classical tradition. Therefore, when BSO Concertmaster Jonathan Carney performs the composer’s violin concerto, audience members will hear a fiery blend of lyricism, romanticism, exoticism and folk elements. 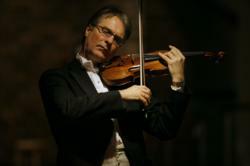 Before appointed concertmaster of the BSO in 2001, Carney held the same position with several major orchestras including the Royal Philharmonic Orchestra, Bournemouth Symphony Orchestra and Basque National Orchestra. In another piece based on a Russian folktale, Stravinsky’s Firebird tells the story of a luminous, part-bird/part-woman creature that is both a blessing and a curse to her captor. Although Stravinsky was unimpressed by the subject choice, he far exceeded expectations of its commissioner, ballet impresario Sergei Diaghilev, who turned to Stravinsky as a third choice after two other composers had turned down his offers. Despite Stravinsky’s lukewarm sentiments toward the subject matter, the premiere at the Ballets Russes was an enormous success and propelled the composer’s career to a global stage. 2011-2012 marks Lionel Bringuier’s fifth season with the Los Angeles Philharmonic in the newly-created position of Resident Conductor of the orchestra, further deepening his ties and commitment to an institution and artistic team to which he has shown deep affinity his entire career. It also marks his final season as Music Director of the Orquesta Sinfónica de Castilla y León in Valladolid, Spain. In Valladolid, his presence spans eight subscription weeks and includes performances around the Castilla and León region. The artistic planning with his Spanish orchestra is built around an in-depth look at the works of Brahms and Beethoven. In the autumn, his first fully-staged opera production of Bizet’s Carmen took him to the Royal Swedish Opera for fourteen performances, with Katarina Dalayman in the title role. Additional guest conducting highlights include engagements with the Boston Symphony Orchestra, the Cleveland Orchestra, the BBC Symphony Orchestra, Zurich Tonhalle Orchestra and the Bamberger Symphoniker. Winner of the 49th Besançon Young Conductors Competition in 2005, Bringuier was the unanimous choice of the Besançon jury, the “Prix du Public” as audience favorite, as well as the top vote of the musicians of the festival orchestra, the Orchestre National du Capitole de Toulouse. Since this triumph, he has conducted and been invited to return to some of the top orchestras in the world, including the Sächsische Staatskapelle Dresden, the Orchestre Philharmonique de Radio France, the Los Angeles Philharmonic Orchestra, the New York Philharmonic and the Cleveland Orchestra. Born in Nice, France in 1986, Bringuier attended the Conservatoire National Supérieur de Musique de Paris from the age of thirteen, beginning his conducting studies in 2000 with Zsolt Nagy. He has also participated in masterclasses with Peter Eötvös and Janos Fürst. In June 2004, he obtained his diploma in cello and conducting with “Mention Très Bien à l’unanimité.” Other distinctions include the “Médaille d’or à l’unanimité avec les felicitations du jury à l’Académie Prince Rainier III de Monaco,” the “médaille d’or” from the Lord Mayor of Nice as well as first prize in a competition organized by the Janacek Philharmonic Orchestra in Ostrava. Bringuier has also received prizes from the Swiss Foundation Langart and the Cziffra Foundation. BSO Concertmaster Jonathan Carney began working with the Baltimore Symphony Orchestra in 2001, after 12 seasons in the same position with London's Royal Philharmonic Orchestra. Born in New Jersey, Jonathan Carney hails from a musical family with all six members having graduated from the Juilliard School in New York. After completing his studies with Ivan Galamian and Christine Dethier, he was awarded a Leverhulme Fellowship to continue his studies at the Royal College of Music in London. After enjoying critically acclaimed international tours as both concertmaster and soloist with numerous ensembles, Mr. Carney was invited by Vladimir Ashkenazy to become concertmaster of the Royal Philharmonic Orchestra in 1991. He was also appointed concertmaster of the Bournemouth Symphony Orchestra in 1994 and the Basque National Orchestra in 1996. Recent solo performances have included concertos by Bruch, Korngold, Khatchaturian, Sibelius, Nielsen, the Brahms Double Concerto and Vaughan Williams' The Lark Ascending, which was featured as a live BBC broadcast from London's Barbican Hall. He has made a number of recordings, including concertos by Mozart, Vivaldi and Nielsen, sonatas by Brahms, Beethoven and Franck, and a disc of virtuoso works by Sarasate and Kreisler with his mother Gloria Carney as pianist. New releases include Beethoven’s Archduke and Ghost trios, the cello quintet of Schubert and a Dvorak disc with the Terzetto and four Romantic pieces for violin. Mr. Carney first performed with the BSO during the 2001-2002 season as concertmaster during the Orchestra's European Tour (November-December) and on three subscription weekends, most notably with his moving interpretation of Richard Strauss' Ein Heldenleben. His violin is a 1687 Stradivarius, the Mercur-Avery on which he uses "Vision" strings by Thomastik-Infeld. Carney's string sponsor is Connolly & Co., exclusive U.S. importer of Thomastik-Infeld strings. Tickets range from $39 to $98 and are available through the BSO Ticket Office, 410.783.8000 or BSOmusic.org.